The florists at Four Seasons know that it can be daunting to browse the wide selection of products we have available on our website when you aren’t really sure what you’re looking for, which is why we have created this page of our site specifically for our customers to look at items which they know have been highly rated by others. All of the products available at Four Seasons are guaranteed to be of excellent quality, but nevertheless we know that the top rated by you collection is very helpful for many of our customers. There is a wide range of different products available in this collection, and with many different styles and colours on offer, our florists are confident that we will be able to offer something for all tastes. However, if you are struggling to find exactly what it is that you’re looking for, there is no need for concern. Here at Four Seasons florists we offer a bespoke flower arrangement service for all of our customers to consult, allowing you to order a truly unique and personalised bouquet. The florists at Four Seasons have over 40 years of experience in the floristry industry, meaning that the hand-crafted flower arrangement which you receive from us will be of the highest quality. The level of skill and expertise our florists use when creating bouquets is sure to leave you impressed. Only the freshest flowers available are used in all of our bouquets, meaning that your flower arrangement from Four Seasons will stay bright and fresh for at least seven days. We order our flowers from Holland on a regular basis, meaning that our customers can enjoy some of the most beautiful flowers in Europe when they order from us. Look no further that Four Seasons Florists for a bouquet which will surely impress you today. The top rated by you collection from Four Seasons Florists allows you to browse some of the most popular items we have available on our site. Our florists are dedicated to constantly maintaining high standards in all of our flower arrangements, as we believe that it is essential for our customers to be impressed with everything that they receive from us. However, we also know that the quality of the flower delivery service which you receive from us is just as important as the beautiful flowers which you have delivered. The Aberdeen flower delivery service operates a reliable and efficient service throughout Aberdeen and the local area six days a week. When placing your order with us it is easy to request a day of the week, from Monday to Saturday, for your flower delivery to take place. It is also possible to request a time slot for your delivery, as it can be delivered either in the morning or the afternoon. One of our very popular services is the same day delivery option from Four Seasons, as this allows for your flowers to be delivered to you on the very same day as you’ve ordered them. 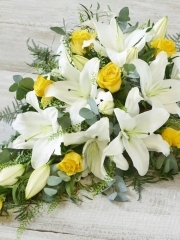 However, to be eligible for this service it is necessary that your order is placed with us before 3pm on the day in question, so that our florists have the time that they need to create your beautiful bouquet with the care and attention it deserves. Flowers Four Seasons is also proud to be a member of the Interflora brand, meaning that we can offer our customers a range of flower delivery services further afield should you so require. Four Seasons Florists can offer you both the gorgeous bouquet you’ve been dreaming of and fantastic flower delivery services to match.